We already find ourselves to be before Great Week and the cosmo-salvific feast of Pascha. Today is Palm Sunday, in which we celebrate the palm-bearing entrance of our Lord into the Holy City. The spiritual fight of all those who struggled during the period of Holy and Great Lent has reached its climax. Hearts are in a hurry to find themselves before the Crucified Lord, to worship Him and express to Him hymns and glorify His Resurrection from the dead. I communicate with you today to wish you wholeheartedly, to finish with joy the sacred fight and enjoy the Paschal joy and gladness. For this reason I desire to draw your attention to certain issues, which we must know about and put into practice as faithful children of our Holy Orthodox Church. 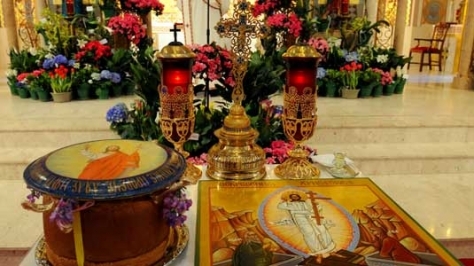 The feast of Pascha is the greatest and most splendid feast of our Church. The earthly and the heavenly celebrate and all things are filled with the light of the Resurrection. The hearts of all the inhabitants of the earth dance with joy and the souls of those in Heaven rejoice with the Angels and the Saints who have from ages past pleased God. On this day we must all partake of the sacred and Eucharistic Table, dancing with the visible and invisible worlds. First, while there is a massive attendance of people at the ceremony of the Resurrection, and this causes maximum joy, yet after this brilliant ceremony and before the Resurrectional Divine Liturgy, some (and alas, not a few) forsake the Risen Lord at the time the liturgizing Priest chants: “Christ is Risen and let His enemies be scattered, and let all those flee from His face who hate Him.” This is a plan and trap of the most-deceiving and good-hating devil, who rejoices when the faithful leave the Church. And I ask you, my brethren: Are all those who leave enemies of our Lord? Do they hate Jesus Christ? Certainly not! But they are lured by a very bad and sinful habit, which in recent years like leprosy has crept into and contaminated our ecclesiastical-spiritual life. It is a great sin to leave the church after the first “Christ is Risen”. My beloved, whoever reads this text, become preachers to our other brethren, that they may understand to remain with joy and prayer in the Paschal Divine Liturgy, and after they can go with the grace of our Risen Lord to their homes to taste of the physical table. Recall, my brethren, the complaint of our Lord to His Disciples, when he found them asleep at the painful hour of prayer at the Garden of Olives: “Could you not watch with Me one hour?” (Matt. 26:40). Could you not for a little while, keep vigil with Me. How do you think they will respond? My brethren, let us fight this evil. Let us heal this plague. I pray for it with all my soul. Pascha is their day and will we be absent from the church? Pascha is their own special feast, and we will be shut in our homes weeping “as others who have no hope?” (1 Thess. 4:13). Our father, our mother, our children, our brother, our sister and whoever else has left this world, will be at the celebration of the Resurrection, and you their child, their mother, their father or whatever other relative, will be absent and in the darkness of mourning, which does not have a place in the hearts of the children of the Resurrection of Christ? All of you, my brethren, come to church. There, before our Lord, before the sacred, the blessed and the immortal Table, we will meet our much-beloved ones who are in the embrace of our Heavenly Father, and we will chant the victory hymn to the conqueror of death, our Risen Lord. Third, I will mention another very important issue. During the final days of Great Week, and especially on the day of Pascha, in many places, in cities and especially in villages, there is unfortunately the evil habit of fireworks and firecrackers. This is a foreign practice to our Orthodox faith, which often ends up being dangerous, because every year in some area we mourn its victims. Many of our fellowmen and in particular (what a shame!) small children, are dangerously injured or maimed. It is a habit which like the others is disrespectful, since it agitates the atmosphere of piety and prayer and distracts the faithful from the ceremony. In our effort and our struggle to bring healing to the liturgical life of our Church from such exceptions, we invite all to celebrate Pascha with caution, silence, prayer and devotion, that we may enjoy the heavenly joy of Resurrection gladness. Protect your children, our children, from the dangers above. Do not encourage them in unfamiliar and dangerous “celebrations”. I believe that the voice of your Bishop, which comes from a love for all in his heart, will be heard and we will all have the joy to celebrate Pascha together with the Angels and the Saints. A good Great Week, a good spiritual struggle and a good Resurrection. « To What Purpose this Waste?